A few months ago I had, what I thought was a crazy idea at the time. What would it look like to have 26 quilters each make a letter from my latest English Paper Piecing pattern, Typecast, and feature each maker and project? A moment of panic set in… did I even know 26 people? After brainstorming, planning, and lots of emails, 27 talented quilters (the letter “Q” is so special, there needs to be two quilters!) agreed to participate. 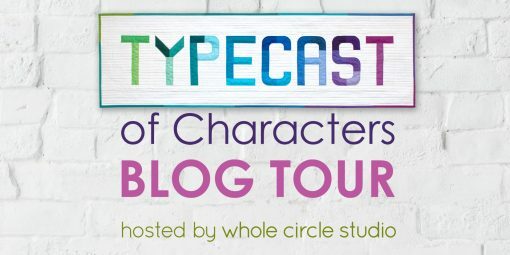 The Typecast of Characters Blog Tour was born! Over the next seven Fridays, I’ll introduce you to the all-star line up of quilters and the project they made using Typecast. Of course, we’ll work alphabetically and what’s a tour without prizes? Each week there will be a giveaway with quilting prizes you definitely want to add to your collection. Be sure to read through to the bottom to enter for a chance to win this week’s prize, sponsored by Aurifil. Make your own letters & words! 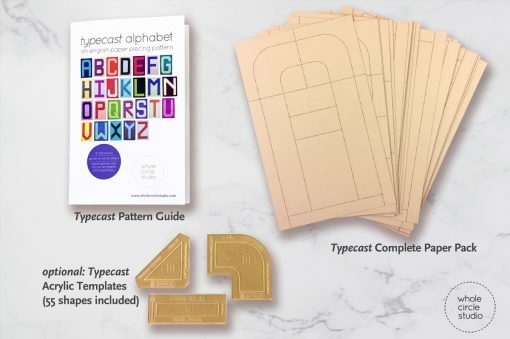 Get your own Typecast Complete Paper Pack & Pattern Guide or the Typecast Guide + individual paper pieces and make your own letters and words! 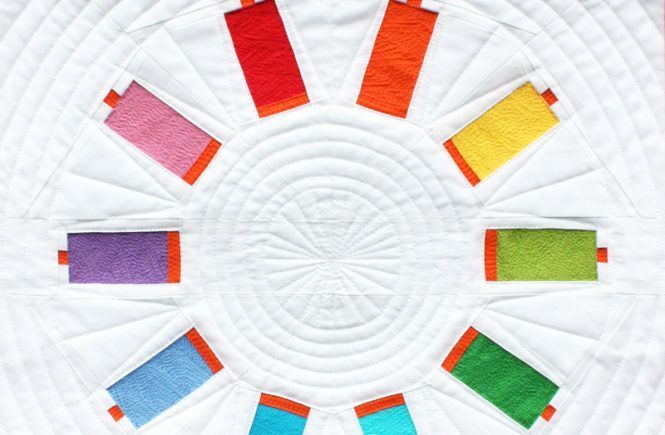 Kate Brennan, Sales & Customer service extraordinaire of Aurifil, kicked off the blog tour. 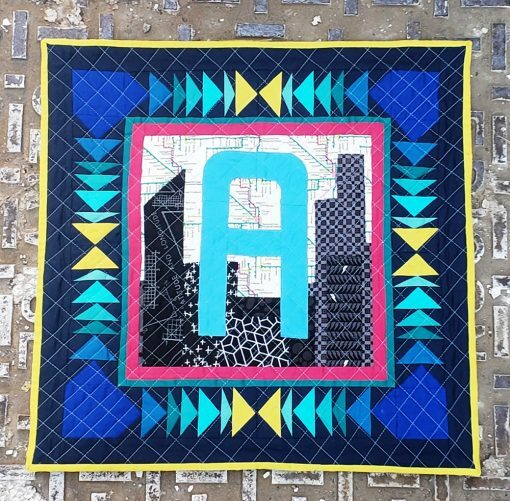 I love how personalized the Typecast “A” with the Chicago skyline, where she resides and home to Aurifil USA! 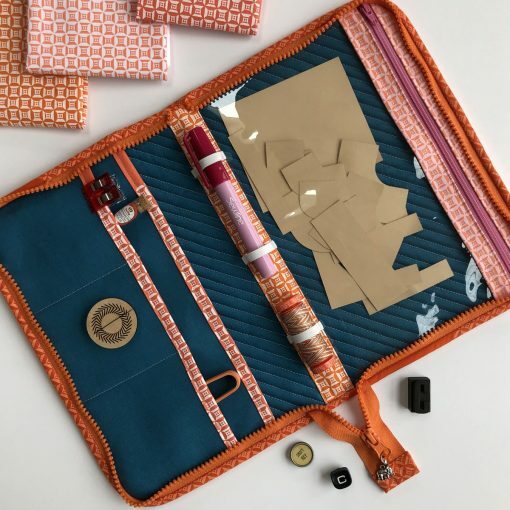 Be sure to head over to the Aurifil blog for a mini tour of Chicago and her thread tips for English Paper Piecing. Awesome job Kate! Mister Domestic did it again! 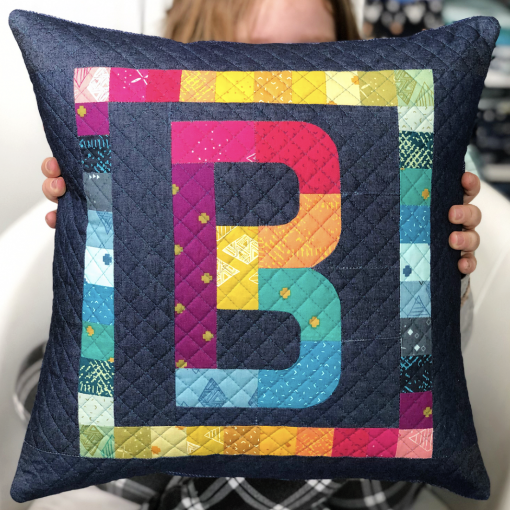 I adore his beautiful rainbow Initial Pillow (Mister Domestic actually has a real name… Mathew Boudreaux, hence the “B”). 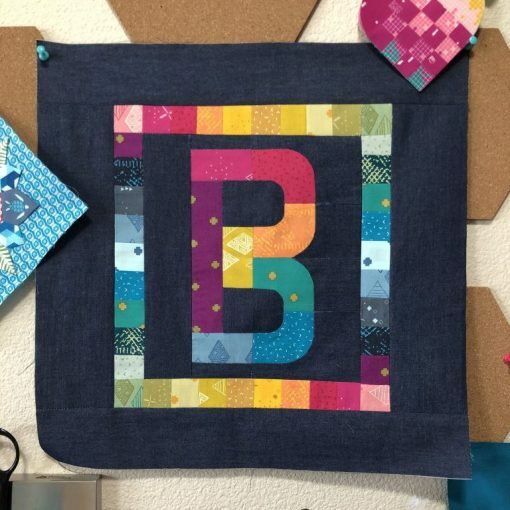 Head over to his page to get all the details on how he combined the Typecast English Paper Pieced “B” with a machine pieced border. You’ll also drool at the close-up image of his quilting. Beautiful work Mathew! Tara Curtis of Wefty Needle knocked it out of the park! 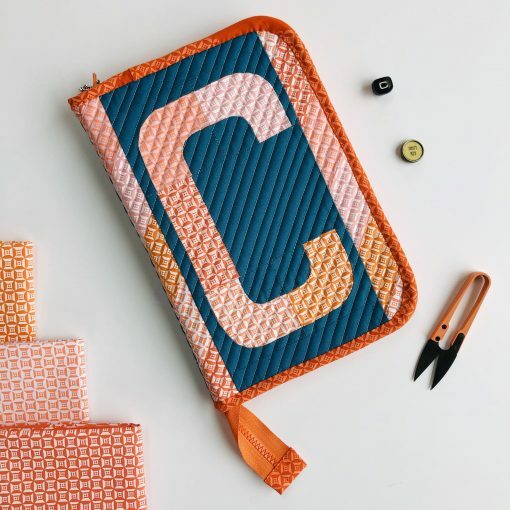 I love how she combined Typecast with “Oh Zippered Case” (a free tutorial by Oh How Sweet Co). It’s a perfect project to organize all of your EPP tools and supplies! 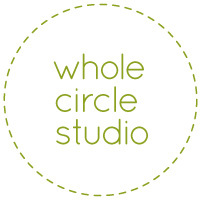 Hop over to her blog to learn about Tara’s favorite EPP and supplies. She also gives her special tips for sewing on the binding. Cool project Tara! 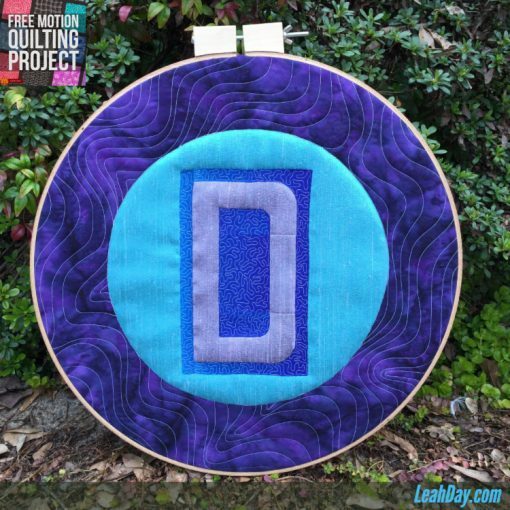 Check out the largest hoop quilt Leah Day has made to date, all hand pieced using EPP techniques, with a Typecast letter “D”. Head over to her blog to learn about her experience using silk with EPP. 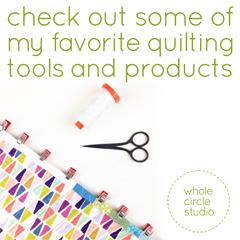 I believe she’s the first on the blog tour to use non-quilting cotton! Dynamite Leah! Pick up your Typecast Guide and Paper Pack and make something great with us! 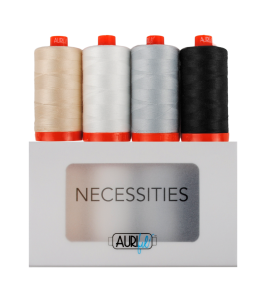 Enter for your chance to win a Necessities Thread Collection by Aurifil—perfect for English Paper Piecing! (sponsored by and mailed directly from Aurifil). 2. In your comment, answer: Do you EPP (English Paper Piece)? If not, are you inspired to do so after seeing these awesome projects? You have until 8pm EST on Monday, April 8, 2019 to enter. GIVEAWAY CLOSED. Congratulations to the winner: Kathie L. Thank you to all who left a comment! Love the projects shown so far! I have done some EPP, mostly hexagons, but want to do more. I just need to get myself in gear and do it! I ❤️ your Typecast letter set. And the quilters’ projects are so inspiring, I am anxious to see the whole alphabet come to life! I have done a bit of English paper piecing, mostly hexies. And after seeing the letters, I do want to try more of it. These look great! I do paper piece but your alphabet can be used for so many things. Really make a project sew fun. 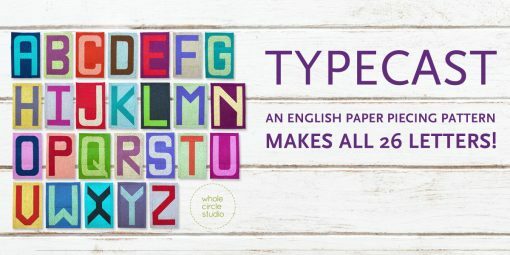 I haven’t tried EPP yet, but the projects of Type Cast sure look intriguing! It was great fun seeing you again at our guild last night! My ‘to-do’ list has grown….. thank you! I do EPP, having finished a hexi full size quilt, with another one in the works. Very therapeutic! I have not done English Paper Piecing. I love to try new things and see a pillow (B is my favorite so far) in my future. First I must conquer Foundation Piecing with Patchwork Petals. I have done English paper piecing, but am always interested in learning another technique. Auriful threads are my favorite threads to use. Looking forward to the whole tour! I have done EPP but not for awhile. I need a new handpiecing project and doing the letters for projects for my twin granddaughters would be great. I have not tried EPP yet, not typically a handwork lover but trying to overcome that with a little hand stitching project. Your letters may inspire me though. I love EPP, have made a few quilts, table runners, etc. And great for take a long project. I would love to win the Auriful threads. I have not come across any in my travels, and would like to try it. I do EEP and plan even more in the future! As a matter of fact, this whole post makes me want to get going on a new project! Yes, I paper piece and love it. I do not EPP, however looking forward to trying it in the future. i consider myself a beginner in epp even though i’ve been trying it for over 20 years. i do well with very basic shapes but struggle with more intricate designs. i do want to try letters. I LOVE English paper piecing! It is my go to for relaxation. I have finished an almost king size quilt entirely of hexagons. Nose to hand quilt it. I’d rather make more hexagons! I have not tried paper piecing but willing to take it on. All of the letters are well done but number 8 is clever, cute, useful….Like it the best so far. I’ve been doing EPP for years. I love having something portable to take with me and I usually work on projects while watching TV in the evening. Slow but steady! I have tried it, but life happened and I didn’t finish it. I think I will have to try again. I haven’t done any for several months, but I do enjoy epp. Yes, I have done EPP (English Paper Piece) at a workshop. I love to paper piece small projects. What a fin idea! I love EPP!!! I have dabbled in EPP but by no means am I an expert. I did enjoy it though! I have not done epp yet, but I am ready to try! I have not done any EPP, this my be the project to get me started! What a fantastic idea! The only EPP I have done is hexies. Your letters intrigue me. I took a class last year and have been slowly working on my first project. I have always been intimidated by EPP. However, every time I am at baseball/softball practice or dance class, I would love something for my hands to do! Love the zipper pouch! What a great gift! Haven’t done any EPP to date but maybe I’ll give it a whirl! I learned the basics of EPP about six years ago and have completed several projects. 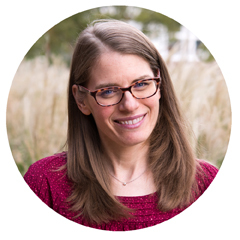 I’m ready for some new ideas and love what you are introducing us to in this blog. I love to EPP. Seeing all the great ideas from so many talented people is inspiring. I love EPP. Can’t wait to try Tupecast! I also love Aurifil thread!! These projects are awesome!!! I’ve never tried to EPP and the letter pillow would be my first project!! I don’t do much EPP or hand sewing, it tends to hurt my wrists. Every once in awhile there is a hand-sewing project I just have to make! I’ve only just begun my EPP journey and am enjoying it. 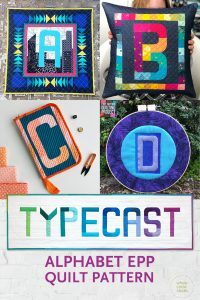 The typecast letters looks like a fun project! Hello, yes, I’ve done EPP for a few years>love it! Thanks for sharing on your neat Blog and with a pretty giveaway too! I did EPP years ago and am just now trying it again! Love the letters but I have not tried EPP. I’m new to quilting and I am still trying to perfect my 1/4 seams. Haven’t done EPP in a long time, but I am inspired to pick it back up again! Lovely work! The extent of my EPP has been only hexies but I have enjoyed that much. Thanks for the opportunity to win! I have never done any EPP, but I just love the letters!! So many things to do with them!! Thank you for the opportunity to win such great thread! I’ve done quite a few EPP projects using hexagons. It would be fun to try these other shapes. Thanks. Aurofil is one of my go-to threads for piecing, applique and quilting. I haven’t tried EPP, and rather doubt that I will. However, I used to say that appliquewas a four letter word, and now I am a happy and confident appliquer. Recently learned how to EPP and I love it! I have done EPP, but have no EPP projects at the moment. I love the oh zippered case, I may have to look that one up and give it a try. Aurifil is the only thread recommended by my Bernina class. I have been trying to get a few spools ahead. I have been seeing so much it is hard to build up a little stash of thread. I would be thrilled to win some. Aurifil is the only thread recommended by my Bernina class. I have been trying to get a few spools ahead. I have been seeing so much it is hard to build up a little stash of thread. I would be thrilled to win some. I have not tried EPP but would love to try. This looks so fun for baby quilts. I am currently working on Lucy Boston’s POTC in non-traditional colors. I got started on EPP while looking for a portable project to take on a cruise. Yes, many projects, my 1″ hexie queen sized quilt is about 80 percent done- almost 4 years in progress! 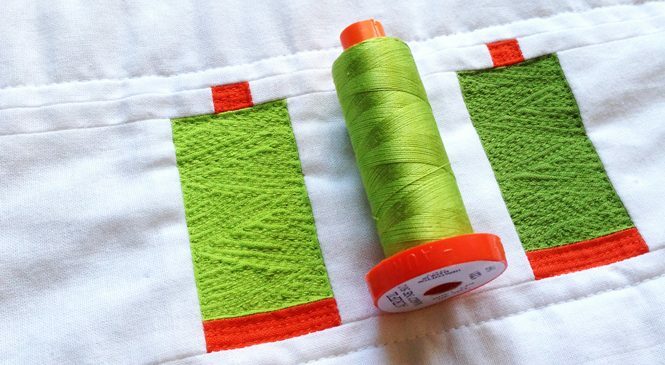 I exclusively EPP and love converting standard quilt patterns into mini EPP versions. I’m currently working on a monthly row by row EPP quilt from the UK among other projects. These letters are so pretty and versatile! I would like to try EPP. I love the letters and hope to try some soon. I do EPP and love it. I did a hexagon quilt–called it my flower garden explosion because of all the bright colors. I like to have handwork to do when traveling and EPP is perfect–can be packed in a little bundle and I don’t need a lot of supplies. Yes, I have a long-term EPP project I’m working on, and I just started gathering what I need to make the Tula Nova EPP quilt. But seeing your fabulous EPP alphabet has me excited, as anything texty always does. I don’t EPP, but would like to. I need some hand work projects. These examples are lovely! Congrats on your book. I have been making hexies for a while, but have yet to complete a project. I find the hand sewing very relaxing and love the color mixing possibilities. EPP is next on my list of I must learn to do. Aurifil is by far my favorite thread ever. I have not done EPP yet, but I have always wanted to try it. I recently started paper piecing, and I love the fun and beautiful effects that are possible. The letters are great! This is true inspiration!! I want to do this! I have only done epp with hexagons!! Thank you!! I have only made one simple project using the EPP method and the results were fantastic! I definitely will do more! I have been doing English paper piecing for a few years and love it. I find it so relaxing and portable! Thanks for inspiring us. I recently tried English paper piecing and prefer it to the traditional method. I have done EPP but have lots of practice needed to become at ease. I enjoy too many techniques. Really enjoyed your class and lecture at Herring Run Quilters’ Guild this past weekend! Nice to meet you this week! I have not dared try EPP yet because I am afraid it will become one more addiction! I need to finish a couple UFOs first, one of which is a paper-pieced project that I am working 50% by hand, so that is my current travel project. I loathe paper piecing, even though I am inspired by the precision is allows. I just hate to cut a piece, and then TRIM it. Such a waste! Great presentation at Herring Run Quilt Guild yesterday. EPP will be a challenge for me to try, love the alphabet. Your range of work was great, super show and tell…shutters scrappy is on my list. I really enjoyed your presentation at Herring Run and plan on making your Bee pattern soon. Your quilting and designs are amazing. I have tried a few EPP projects but I am addicted to applique at the moment. I have done a little bit of EPP and I really enjoyed it! Would love to do some more! Loved your Big Island Sunset Class! Thanks again. I would love to win the thread! I need to up my EPP game. I have not done English Paper Piecing, but after seeing these beautiful letters, I just may give it a try. I have not tried it yet, but I am always game to try new things! I have not tried EPP yet…. I love trying new quilt projects. Great blog! Thank you for the giveaway too. I have done some EPP, but just might be inspired by these letters to start doing even more. Exciting!! Love Aufil thread, matter of fact, I am machine quilting a twin size quilt with it right now. Enjoyed your presentation at Quilters By The Sea (RI) and look forward to more of your blog.